The wait is over! The list is out and its massive!! – This years Splendour in the Grass Festival features more than 100 artists with Lorde, Kendrick Lamar and Vampire Weekend announced as headline acts for the three day festival. Included in the line up are Aussie artists, Gang of Youths, DMA’s, Hill Top Hoods, Ocean Alley, Jungle Giants, Dune Rats as well as International artists including, The Wombats, Khalid, CHVCHES, MGMT and Franz Ferdinand. Too many to name, so feast your eyes on the full Splendour In The Grass 2018 lineup below, in all its glory, along with all of the dates and ticketing details. 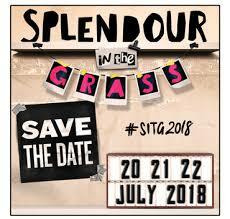 Splendour in the Grass will take place at North Byron Parklands from Friday July 20 to Sunday July 22 . Older PostThe Kaaboo Festival Approaches! !